If you are interested in reading other travel guides and diaries from different destinations too. 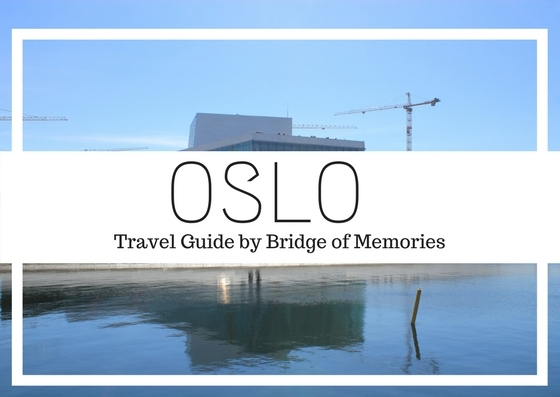 Share with us any tips on what to do, eat or see in Oslo if you do have any too! What to see in Oslo? Oslo Opera house is a place for Norwegian Opera and Ballet. This beautiful building with Italian marble is located in a neigborhood of Oslo center called Bjørvika. This beautiful architecture was designed to look like an iceberg from the distance, and when you look at the building from distance, those people on it will look like penguin. How great the concept it? Akershuh castle is a medieval castle built to protect Oslo and it has been also used as a prion. Located up on the hill with the view on the harbor and to Oslofjords. Oslo doesn't have much history. Therefore this medieval courtyard is one of the important castles in Norway. The Oslo city hall located just in front of the harbour is not only used for city administration, but also as an art studios and galleries. It is a free entrance to get in and I would recommend you to check the inside of the town hall. It is a great place with beautiful rooms and Henrik Sørensen's painted wall. Aker Brygge is a neigborhood for dining, shopping and entertainments. As well as popular for high end residency. It is indeed a great area with such chilled vibe around. It is worth to give a stroll around. Astrup Fearnley museum is a museum of contemporary art located nearby Aker Brygge district, to be specific it is located in Tjuvholmen area. The museum has been moved and re-opened in 2012. The larger and modern space gives a museum new home to hold exciting temporary exhibitions. Grunerløkka is a district of Oslo known for its "hipster" and edgy vibe and is located on the east side of the Akerselva river. In Grunerløkka you can find many industrial buildings, design shops, vintage shops as well as graffiti places. Vigeland is a world's largest sculpture park made by one artist - Gustav Vigeland. The aim of the park is to create sculptures that portrays emotions of people at any stage of life. You can find more then 200 sculptures in the largest park in the city. The Old town (or Gamlebyen) of Oslo is located on the east side of Bjørvika. Oslo does not have much history kept in the city as I have already mentioned. However, the Old town is an urban area where you may find and pass around old churches and buildings. The Royal Palace of Oslo was built in the first half of 19th century for King Charles III. The Palace is an official residence for Norwegian monarch. Come at 1:30 pm to see changing guards every day and during summer time you can book a guided tour. Oslodjords is not an actual fjords in the geological terminology. However, it is still a beautiful scenery and trip to go around islands of Oslofjords, consisting of Hovedøya, Lindøya, Nakholmen, Bleikøya, Gressholmen, and Langøyene islands. The whole boat trip around Oslofjords takes an hour. Hovedøya is the largest and closest to the city. On the west of the island, you can find beaches and great spot for swimming as well as an old monastery to explore. Lindøya island is a beautiful residential island with many colourful houses around. You can get to Oslofjords either by booking a tour or getting a ferry from City Hall Pier 4 and taking lines B1/B2/B3 or B4 (do check timetables and the destinations of each ferry). How to get around Oslo? If you are staying closer to the city then it is pretty walkable around. Oslo is well connected by train to different cities from Central Station. If you want to get around Oslo, the best way is to use trams. They have buses running as well to outside of Oslo. However, tickets for buses are divided into zones. Therefore make sure to check which zone you going into (Oslo City is zone 1), to check zones, visit their official website. You can buy tickets in several ways. Either you will find a ticket machine, at shops, buy at the driver or download a RutterBillett app to purchase tickets. If you buy the ticket in advance, before you enter the vehicle, it is cheaper rather then buying at the driver. Standard one way ticket (1 hour) cost 33 NOK (for an adult) and 24 hours ticket cost 90 NOK. You can use these tickets also on standard boats/ferries to islands around Oslofjords, because for them is a usual transport system as well. To check different ferries lines, visit this site. Ferries are usually running once in an hour. Where to eat and drink in Oslo? Where to shop in Oslo? I have flew from London to Oslo Gardermoen and then from Oslo Torp (Sandefjord Airport) back to London. Oslo Gardermoen airport is the closest and the most convenient airport to get to the city center. I have got my NSB train ticket (the local train) to Oslo central station at the place and it took only 20 minutes to get to the center. You have other options to get to city center such as by bus or a private train company. However, the cheapest and fastest option is to get a NSB train for around 90 NOK. On the other hand, if you are flying in or out from Oslo Torp airport, it takes around 1 h 45 min up to 2h to get to the airport. And the only best option to get there is by Torp Express bus. You can buy tickets in advance online or at the place in the bus. During our weekend stay in Oslo, we have booked our lovely cosy apartment through Airbnb. Book your next stay wherever through this Airbnb link to get £12 off your first booking.